The Society of Columbia Graduates (SOCG) has selected Shih-Fu Chang, the Richard Dicker Professor of Telecommunications, as one of its two recipients of the Great Teacher Award, an honor given annually to professors for exemplary undergraduate teaching at Columbia College and Columbia Engineering. The society has also chosen Stuart Firestein, professor of biological sciences at Columbia College, as a recipient of the award, which will be presented to both professors at the group’s annual awards ceremony June 1 in Low Rotunda. Students have credited Chang for his technical expertise in the classroom and how his genuine enthusiasm and passion for the subject resonates in his teaching. 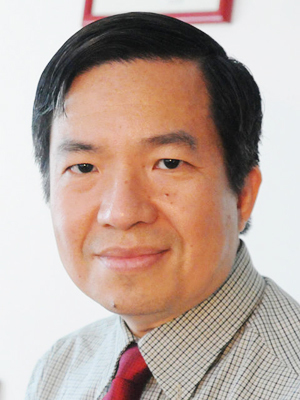 Chang is a pioneer in the development of new techniques and systems for multimedia content analysis, retrieval, and communications while addressing related challenges in signal processing, computer vision, and machine learning. He and his students have published numerous articles on multimedia search and have developed some of the earliest image search engines contributing to today’s foundation of content-based visual search and Internet image search capabilities. Students like Chang for delivering “easy to follow” lectures that are “clear and organized” and have said the homework he assigns really help them understand the course. Chang came to the Engineering School in 1993 as an assistant professor, and during his time at the School, has served as chair of the Department of Electrical Engineering from 2007 to 2010. He joined Columbia following his PhD at University of California, Berkeley, where he also earned his master’s degree. Before Berkeley, Chang completed his BS in electrical engineering at National Taiwan University. He is a fellow of the Institute of Electrical and Electronics Engineers (IEEE) and the American Association for the Advancement of Science, and was recently honored with the IEEE 2012 Signal Processing Society Technical Achievement Award for his pioneering contributions to the field. The SOCG established the Great Teacher Award in 1949 to honor the outstanding teachers from Columbia College and the Engineering School. Two awards are bestowed each year to one professor from each school. Chang joins an impressive list of past recipients, including the late historian Jacques Barzun and former University Provost Alan Brinkley, and in recent years, fellow Columbia Engineering Professors David Yao, George Deodatis, and Kathleen McKeown.